I count myself as a member of the masses who got caught up in the wave of Greek yogurt that swept the U.S. a few years ago. For those of us who grew up thinking that yogurt was a fruity, sugary-sweet liquid meant to be spooned from a plastic tub as a “healthy” treat, the new abundance of richer, tangier options in the supermarket aisles seemed just plain heavenly. 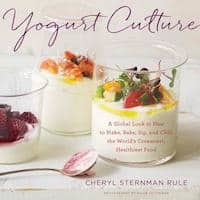 Now Greek yogurt is everywhere—enlivening smoothies, juicing up marinades, and kicking sour cream out of the way in party dips and mashed potatoes—but as Cheryl Sternman Rule proves in her new book Yogurt Culture: A Global Look at How to Make, Bake, Sip, and Chill the World’s Creamiest, Healthiest Food , it’s not just the Greeks who came bearing gifts. The yogurt culture from which she pulls inspiration includes a host of countries who can claim the ingredient as part of their heritage, from Turkey to France to Switzerland to India to Israel. Yogurt Culture lives up to its name as a global tour of the glories of yogurt, showcasing both its savory and sweet sides in recipes that will take you from breakfast through dessert. If smoothies are your thing, try a glass of pomegranate doogh—a fizzy Persian yogurt soda—on for size. Sweet tooth? 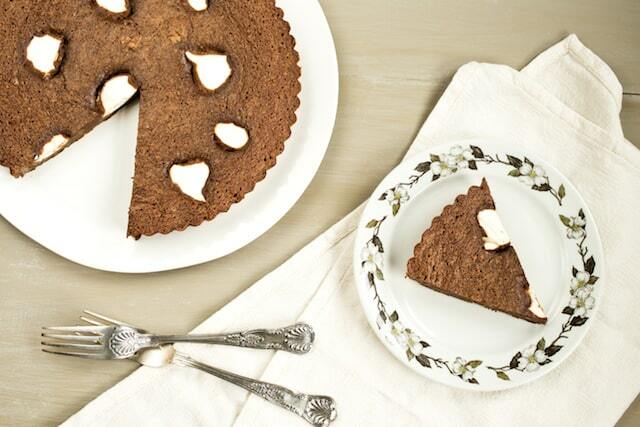 The brownie tart dolloped with Middle Eastern labneh (think cream cheese, but even more spreadable and tangy) matches deep, rich chocolate with equally rich and creamy dairy in a showstopping presentation. The natural tartness of plain, unsweetened yogurt makes it an ideal base for dressings, sauces, and side dishes. 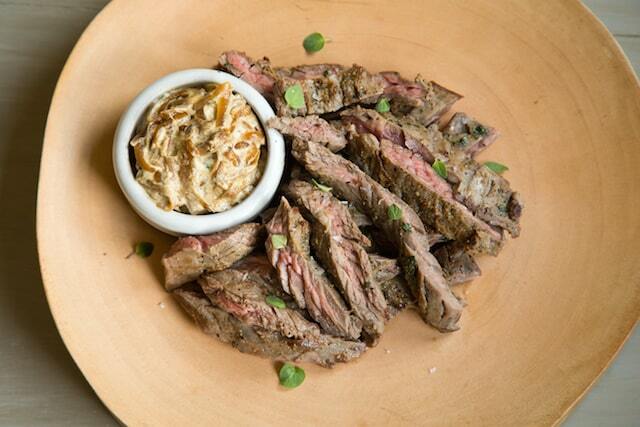 Mixed with caramelized onions, it becomes a steakhouse-worthy accompaniment for slices of peppery herb-rubbed skirt steak. Blended with mustard and apricot preserves, yogurt makes a stunning Provencal sauce for pork chops. Or when stirred with spices, it takes a tip from Indian tradition as a curry marinade. Yogurt’s happy hiding out as a supporting player, but for those of us who are happy just spooning it straight from the tub, the book plays to our cravings with ideas for making yogurt the star of the meal. Bowls of labneh topped with roasted tomatoes and pesto or sprinkled with slices of blood orange, pinches of red onion, and rounds of kalamata olives; or avocadoes filled with yogurt, salmon roe, and dill make compelling arguments for yogurt as more than a snack. If you want to take the plunge and start making your own yogurt—an easier thing to do than a first-timer would imagine—Cheryl’s thorough, conversational instructions will get you there without breaking a sweat. But homemade yogurt isn’t a prerequisite for enjoying the book to the fullest; every single one of the recipes in Yogurt Culture can be made with quality store-bought plain yogurt. Case in point: this breakfast-friendly riff on Yogurt Culture‘s sweet griddled flatbreads studded with crunchy poppy seeds and tender pieces of dried fruit. Made with two types of yogurt—traditional “loose” whole-milk yogurt keeping the dough soft and tender and Greek yogurt adding extra lushness to the clouds of whipped cream on top—the dish is a paean to the dairy’s varied pleasures. Cheryl’s original recipe called for raisins, but with the first sighting of the season’s fresh apricots, I took it in a different direction. Chewy bits of dried apricots in the flatbreads are boosted by roasted, barely sweetened wedges of fresh fruit. Apricots are notoriously elusive little beasts, so if you want to give this recipe a go when they’re not in season, substitute your own preferred pairing of dried and fresh fruit. A one-two punch of cherries, figs, or cranberries all come to mind as equally spectacular alternatives. Oh, and you can make every component of this meal in advance, reheating or just pulling out of the fridge as needed. How’s that for a cultured breakfast? adapted from Yogurt Culture, © 2015 by Cheryl Sternman Rule. Reproduced by permission of Houghton Mifflin Harcourt. All rights reserved. Soak the diced apricots in just enough boiling water to cover the fruit while you prep the dough. Pour the warm water into a medium bowl and sprinkle the yeast evenly over the water’s surface. Swirl to evenly wet the yeast, then let it bloom for 5 minutes until the water is opaque and slightly foamy or bubbly. Whisk the yogurt and honey into the bloomed yeast. Drain the apricots, reserving a teaspoon or two of the liquid. In a large bowl, whisk both flours with the poppy seeds and salt. Gently stir in the wet ingredients and the apricots until a shaggy dough forms, adding the reserved liquid if the dough is too dry. Knead the dough on a lightly floured work surface for about 3-5 minutes—it will be sticky and there will still be lumpiness from the apricots, but you’re just working out the shagginess until the dough itself is smooth. Spritz a clean bowl with nonstick baking spray or olive oil spray and place the dough in the bowl. Cover with plastic wrap and let sit in a warm spot for about 2 hours until slightly puffy. The dough won’t rise like bread dough or pizza dough, but if you poke it with your finger, an indentation should remain. Toss the quartered apricots with the sugar, salt, and oil, and spread evenly on the prepared baking sheet. Cook for 15-20 minutes, just until the apricots are soft and starting to caramelize in spots. Re-flour the work surface and divide the dough into 8 equal pieces. Roll 1 piece into a thin 6-inch round, reserving the remaining pieces. Heat a large cast iron skillet or griddle over medium-high heat until smoking. Scoop 1/4 teaspoon coconut oil onto the skillet and tilt or brush across the cooking surface to spread the oil evenly. Add the flatbread round and cook for 2-3 minutes, until the top side of the round starts to puff in spots; that’s how you’ll know the underside is deeply browned. Flip, adding another 1/4 teaspoon oil to the skillet if desired, and cook for another 2-3 minutes to brown the other side. Roll and cook the remaining flatbreads, keeping the cooked breads warm in a towel or a 200-degree oven. Whip the cream with an electric hand mixer or stand mixer fitted with the whisk attachment on medium speed for about 1 minute, until soft peaks form. Add the yogurt and sugar and whip for a minute more, until the cream is thick and fluffy. 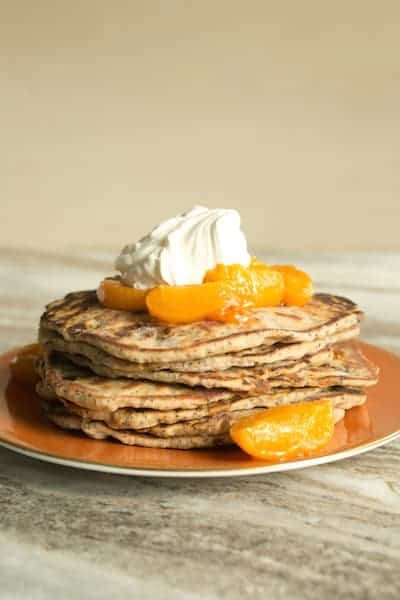 Top the warm flatbreads with spoonfuls of roasted apricots and whipped cream, or serve buffet-style and let everyone add their own toppings as they wish. The flatbreads can be cooked up to 3 days in advance. Cool on a wire rack, then stack and wrap tightly in plastic wrap and refrigerate. Warm in a 300-degree oven for 3-5 minutes before serving. The roasted apricots can be cooked up to 3 days in advance. Reheat in a saucepan over low heat, if desired. The whipped cream can be made up to 1 week in advance. Refrigerate in an airtight container until ready to serve.